A great kit of this, the first US MBT circa 45-55 . Offers a complete engine with the ability to open the access panels. The Pershing had up to 4.5” of armour in cast hull and turret and introduced Torsion Bar suspension with 23” track for US Medium/Heavy tanks. The T26E3 was later standardised (with modifications based on wartime experience) as the M26 and it served throughout the Korean War and with many NATO allies under the Military assistance program such as France and Italy. It was also redesignated as a Medium tank. It went on to be developed into the M46 and M47 with the design lineage culminated in the M60 series of Patton tanks which served into the 90’s. 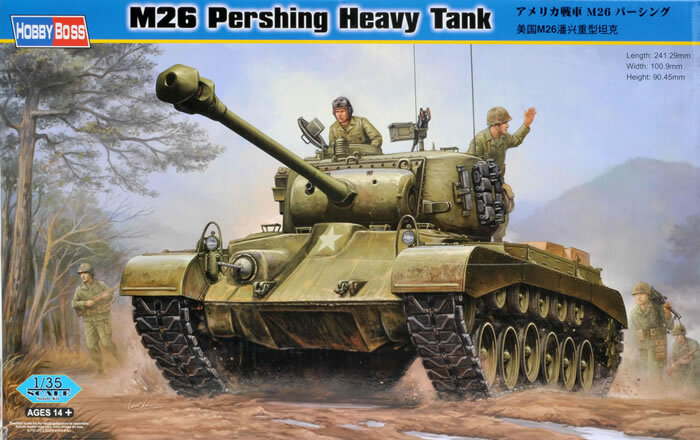 The Pershing has been kitted in this scale before by DML who offered the WW2 T26E3 and the Post War M26A1, and by Tamiya who offered a Post war M26 with some WW2 markings. These are now joined by a Hobby Boss’s first Pershing which in my opinion is marginally the best M26 kit yet released in styrene. 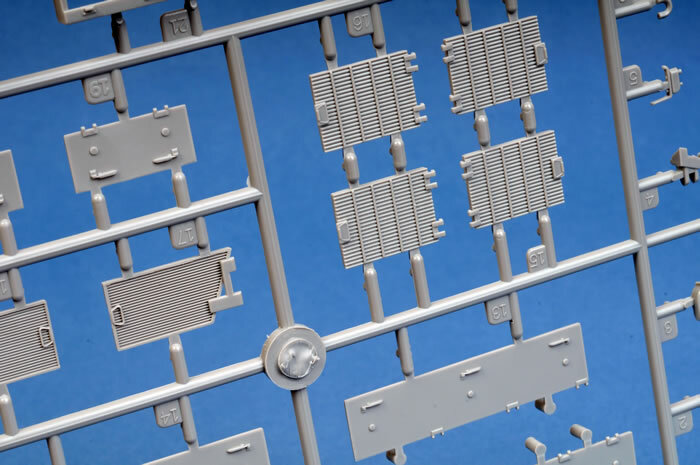 The kit comes well packaged in a Large sturdy box packed approx 333 parts on nine large sprues a one piece upper and lower hull and a large upper turret casting. 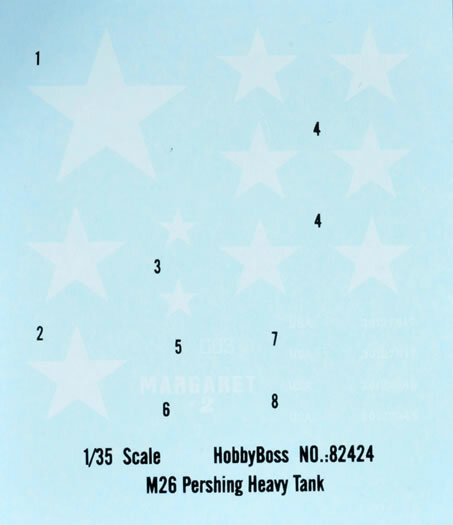 In addition is the usual Hobby Boss instruction sheet, a simple set of markings, Vinyl tracks (T80E1) and a small PE Fret. The instructions are clear, concise and follow usual Hobby Boss layout in a two page folded A5 Format. Given the size of the box I would prefer Hobby Boss offer these on A4 sized sheet. Construction is broken into fifteen stages in a logical progression starting with the Lower Hull and Running gear and concluding with the turret. The kit parts are quite crisp and sharply moulded with most knockouts in out of the way places. The lower hull is moulded as one piece but with separate positional suspension arms attached to plastic torsion bars like the real thing. Final Drive Assemblies are provided separately and these have a moulded on reinforcing bracket limiting this to a post war M26 without a little simple surgery. Drive sprockets are very well detailed and have opened lightening holes although they do not have the internal ribbing. 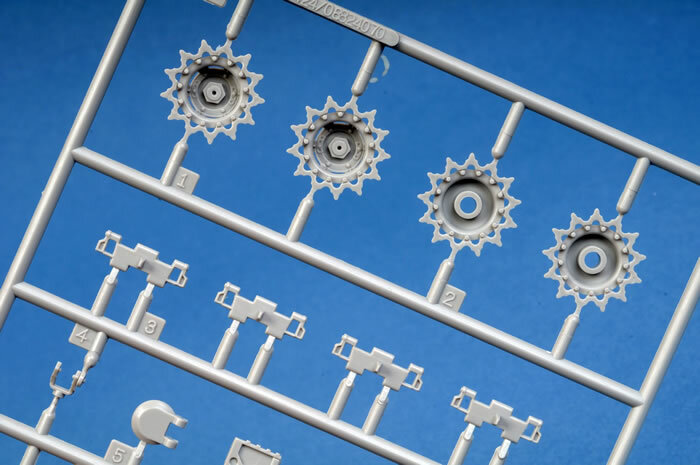 Road wheels are a two part affair and adequately detailed, they are attached to the sprue in two places with a heavy gate so be careful removing them and cleaning them up. The shock absorbers are two part affairs and semi workable. The suspension is not workable but could be posed in various positions due to the way it is engineered. The upper and lower hulls are one piece mouldings with a separate rear (to allow different versions to be kitted?) Fenders are moulded integrally with the separate stowage bins although these have moulded on latches like the Tamiya kit. The Large Blower hump on the glacis is the earlier 400cfm type indicating a hull from the first 500 Fisher built hulls or 235 Chrysler hulled tanks. 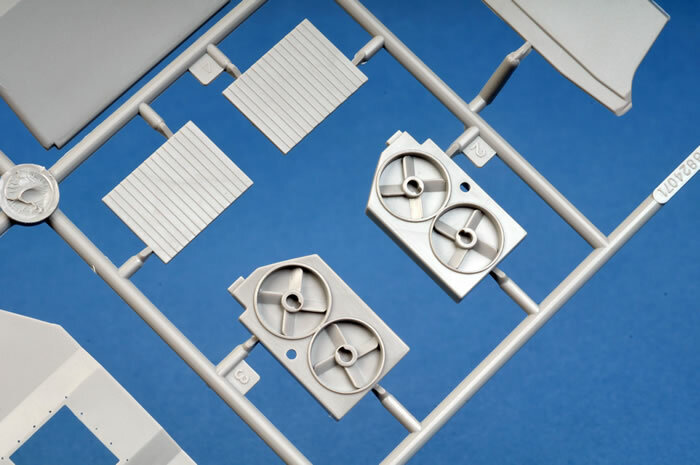 Solid moulding engine deck louvers are really well detailed although not see through like the real thing. To allow for display of the Engine they are separate panels and positionable but not workable. 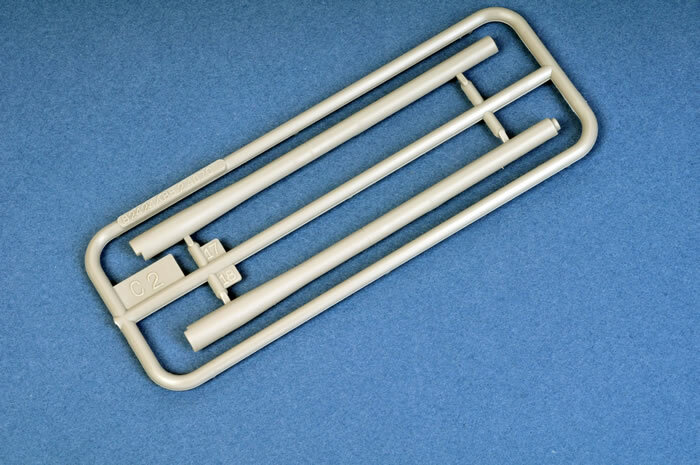 The large Panel above the radiator should not be integral to the piece between front engine access doors (just like the Trumpeter 72nd kit) and is actually two distinct parts. This is easily fixed with a scriber but should have been spotted by Hobby Boss. Moulded on Casting/part numbers are present on the Blower top but not the lower glacis. Fender turnbuckles and an infantry telephone are included which are post war features and the exhaust outlet is a stunning hollow moulding. 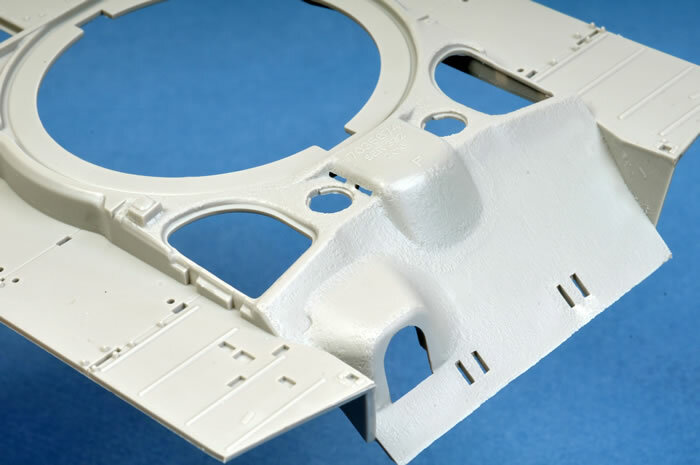 Lights and other hull fixtures are sharply moulded and the light guards supplied in very fine plastic which is thoughtfully wrapped in foam on the sprue. 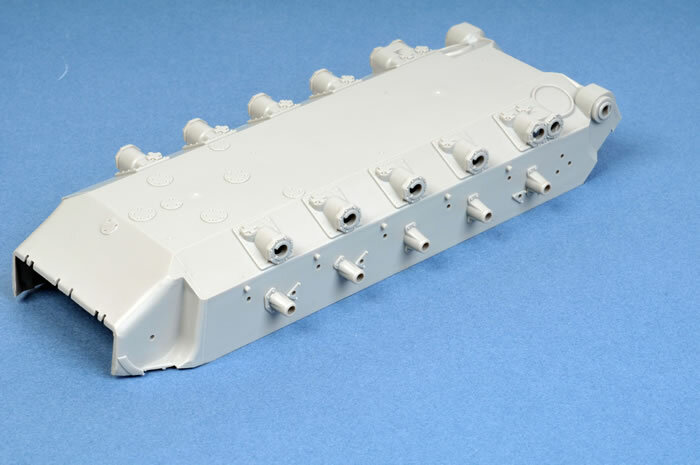 The drivers and all but the commander’s hatches are well done with separate periscope mounts to allow for positioning although the periscopes are not included and shown shut (you can always use the spares from Tasca or DML Shermans). Beautifully moulded periscope guards are however included. 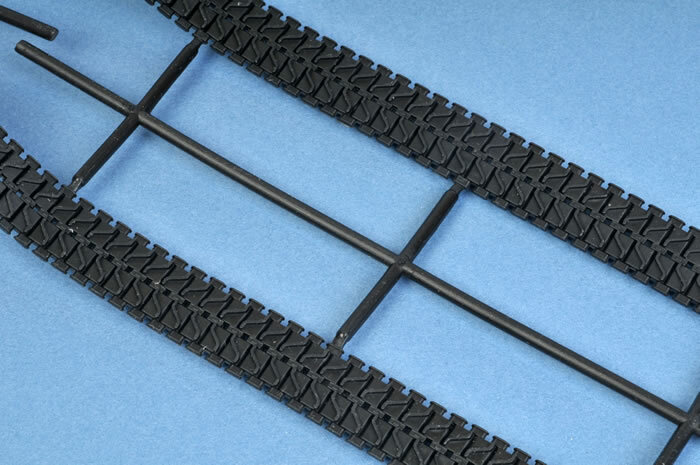 The tracks are vinyl and pliable with good detail on both the outer and inner face. They represent the T80 double steel chevron track typical of post war Pershings. These tracks were commonly seen on Korean War Vehicles and at least one WW2 example. What sets this Pershing apart from others is the well detailed and complete engine compartment which appears very detailed to my references. The engine compartment has all the correct plumbing and includes an Auxiliary motor, fan cases, bulkhead, fuel tanks with PE grills and visible torsion bars. 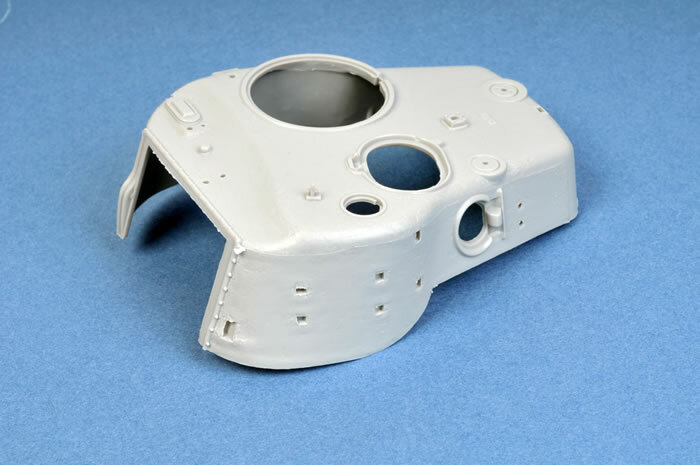 The turret has a great cast finish and has cast/part numbers albeit a little undersized. Unlike the smaller trumpeter kit the hatches can be positioned open although no periscope is provided for the commander’s cupola hatch. The supplied 50 cal MG and pintle are adequate with a correct WW2 Ammo can with a moulded shut lid. Interestingly individual links are provided for the turret brackets but they have supplied T81 single pin tracks and not the T80 as depicted in the main track runs. Cast numbers are on the mantlet although they are very fine and not prominent like the real thing. The kit supplies only an M3 barrel with a well done 2 part muzzle brake. The barrel is a two part affair split horizontally. The markings are in register and options are provided for only three vehicles although no information as to what units these vehicles belonged to. One vehicle has the name Margaret 2 across the glacis with a C03 number on the glacis edge. The second two examples only differ in serial numbers. All schemes are OD with Mr Hobby, Vallejo, Model master, Tamiya and Humbrol numbers given on the colour guide. In summary this is a very good kit of an important vehicle but it still needs a little work in places. For the first time it offers a complete engine compartment but it still has annoying little traits like moulded on latches, no persicopes for the hatches and limited marking options. Most of the mouldings are first class and a great pershing can be made from this kit. If you want a WW2 Zebra mission vehicle you will have to do your homework and remove all the post war features. With the reservations outlined above I feel this is a great kit of a post war pershing and offers excellent value for money with shop price here being exactly what I paid for the DML T26E3 Pershing when it was released in the 90’s. If you want a Pershing kit, buy this one. Thanks to The Hobby Company Limited for the review sample.